[Updated 9/13 5:42pm] It's been a great month for the Redskins, but not for poor Chris Cooley. This guy just can't catch a break. He was cut at the end of Redskins Training Camp just before our comeback season started with RGIII, and now, Reliable Source reports that he is divorcing his wife of four years, Christy Cooley. 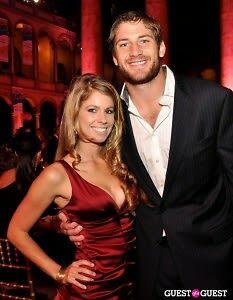 The pair were buzzed about since day 1, when she had to leave her $75-per-game post as a Redskins Cheerleader to marry him. The two don't have any kids together, which should make the break a little cleaner, but it's such heartbreaking news since the two were darlings of the Redskins fanbase.